Since 2017 the alumni of the EPRIE program are publishing their own publication, the EPRIE Journal for Regional Integration in East Asia and Europe. The journal covers the topics of EPRIE as well as the activities and research of the alumni. Until 2016 the journal had been published by Korea Verband as KOREA FORUM special issues. The KOREA FORUM is one of the few publications in the German-speaking countries, which is especially concerned with Korea and East Asia. EPRIE 2017 focused on migration, integration, and belonging. Following on from that, this issue highlights the struggles migrants and refugees face following their arrival in a new country and a new society. We examine the migrants and their stories, as we believe they can tell us where we have to direct our attention and how we can effectively avoid people feeling excluded. We illustrate that multiple senses of belonging exist and that migrants have become an integral part of their adopted society. They actively take part in civil society and engage with other migrants at various NGOs. Although migrants have become an integral part of our societies, many of them are still facing everyday racism. We adress on how to deal with everyday racism and how we can become aware of our own privileges when we work with others. Since integration and inclusion also need to take place in exchange programs like EPRIE, we report on available methods such as Open Space and Design Thinking and how we can practice inclusion in groups. 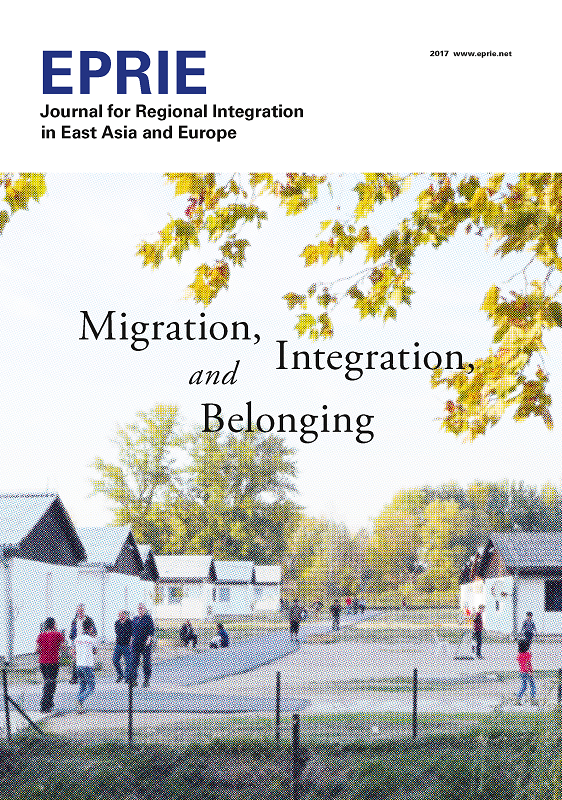 This issue focuses on the prevailing topic of migration and integration. This topic is highly controversial discussed within the EU and has already led to substantial changes in cooperation between EU member states. East Asian countries address these topics in different ways. 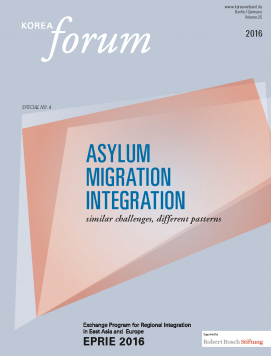 In this issue we focus on new thoughts and ideas and on critical perspectives of integration, where both sides are involved: the minority as well as the majority populations of a society. We want to give a forum to refugees and migrants who actively fight for their rights and needs. And we also want to provide a forum for specialists and experts working with them in the field. The KOREA forum SPECIAL series on EPRIE explores the various topics touched upon in the seminar and therefore represents a platform for the ongoing exchange of opinions. You can download the KOREA forum EPRIE Spezial No.4 here or get your free copy in Korea Verband's Shop. 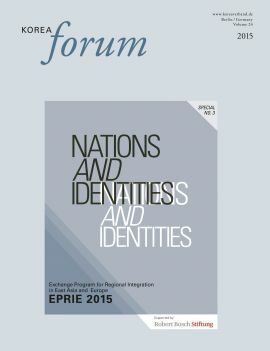 The KOREA forum EPRIE Spezial No.3 focuses on the emergence of national identities. What does consciousness draw on to be part of a nation? What images, metaphors and stereotypes are tied to it? And how can they be changed? Besides historical education and activities for peace education on a civil society level, new initiatives and obstacles for regional cooperation in East Asia are discussed. The KOREA-forum SPECIAL series on EPRIE examines nations and nationalism against the backdrop of regional complexity. It explores the various topics touched upon in the seminar and therefore represents a platform for the ongoing exchange of opinions. More and more alumni make use of this opportunity to continue the dialogue. You can download the KOREA forum EPRIE Spezial No.3 here or get your free copy in Korea Verband's Shop. 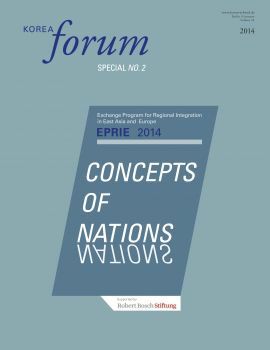 "Concepts of Nations" was the title of EPRIE 2014 and is also the title of the second publication on EPRIE. The volume includes essays on the concepts of nations and the reconciliation between countries. Mediators also wrote about their experience in conflict resolution. Several alumni of the program contributed to the issues: they summarized the content of EPRIE and wrote short essays on bilateral conflicts in East Asia and Europe. A memorandum of this year's participants - translated in Chinese, German, French, Japanese, Korean, Polish, and in the program language English - is also included. You can download the KOREA forum EPRIE Spezial No.2 here or get your free copy in Korea Verband's Shop. 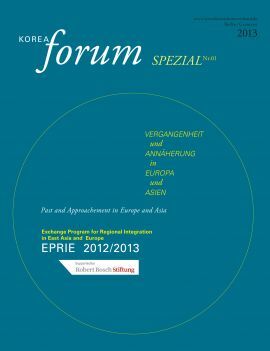 The first publication on EPRIE, the KOREA forum SPEZIAL No.1, covers the EPRIE seminars in 2012 and 2013. Both EPRIE seminars offered rich sources of highly interesting contributions. The editors of the Korea Forum took advantage of the opportunity to pool some selected contributions into a special publication with the topic, ›The Past and Rapprochement in Europe and East Asia‹. It is significant that not only sophisticated experts shared their knowledge, but also young participants from five different countries. How were the ten to twelve day meetings in at least two countries and three cities received? Which prejudices existed? Which insights can they carry into future debate and discussion? 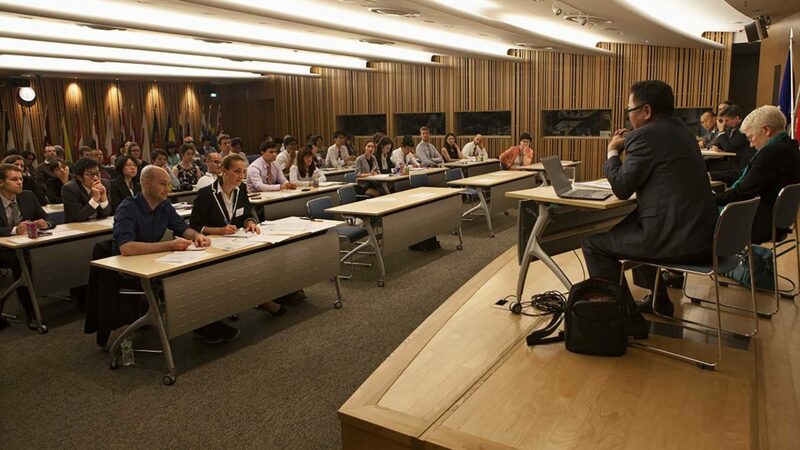 The results come in a variety of formats – as speeches, as reports, as academic contributions and also as a joint memorandum, taking into account their differing perspectives, and which they translated into their respective languages – German, French, Japanese, Korean, Polish, and in the common language English. Since EPRIE 2012 was held in Grman and EPRIE 2013 in English language, the articles are written either in German or in English. You can download the KOREA forum EPRIE Spezial No.1 here or get your free copy in Korea Verband's Shop.